Allergy Advice: Contains Wheat, Soy, Egg. May contain peanut products and milk products. Ingredients: Wheat Flour, Sugar, Vegetable Shortening (Palm Oil) (Contains Antioxidant (Soy Lecithin, Ascorbyl Palmitate, a-Tocopherol)), Egg, Margarine (Contains Emulsifier (Mono & Di-glycerides Of Fatty Acids), Antioxidant (Soy Lecithin, Ascorbyl Palmitate, a-Tocopherol), Artificial Colour (Carotenes)), Egg Yolk Powder, Leavening/Raising Agents (Sodium Carbonates, Ammonium Carbonates, Calcium Phosphates), Non-Dairy Creamer (Contains Acidity Regulators (Potassium Phosphates, Triphosphates), Emulsifier (Mono And Di-glycerides Of Fatty Acids, Diacetyltartaric And Fatty Aluminosilicate), Artificial Colour (Carotenes)), Salt (Contains Anti-caking Agent (Sodium Ferrocyanide)), Acidity Regulator (Calcium Carbonates), Artificial Colour (Carotenes) (Contains Stabiliser (Starch Sodium Octenyl Succinate), Antioxidant (Sodium Isoascorbate, Triphosphates, a-Tocopherols), Acidity Regulator (Citric Acid)). 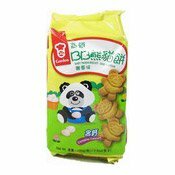 Simply enter your details below and we will send you an e-mail when “BB Baby Panda Biscuits (Egg) (嘉頓熊猫餅)” is back in stock!